This entry was posted on 21st October 2015 by Tom Richardson. “Travelling to Mongolia’s westernmost province gives one the distinct feeling of reaching the end of the road, if not the end of the earth." He didn't even mention the relatively frequent sightings of snow leopards, the nomads and their hunting eagles and the fact that there are more reported sightings and stories of yeti here than anywhere else in the world, including the Himalaya. For me 2015 was my 7th trip to these superb mountains, getting time off from working in Outside to lead a group for KE Adventure Travel. There were 11 team members, 10 from the UK and one from Canada, comprising 4 women and 7 men with an age range from 37 to 74 years. The team were experienced in a variety of mountain regions including previous KE trips. Before leaving the capital Ulaan Bataar for the mountains, we had a warm up trek in the nearby National Parks. We summitted the Tsetseesgun view point and visited the new Mongolia attraction of the giant stainless steel Genghis Khan. One of the things that makes the trips in Mongolia go well is our local support team. Sandagash is a school teacher in the major settlement in the region, Bayan Olgii, a Soviet built border town, populated by people of Kazakh origin. She works on our trips during the holidays and organises all the provisions and equipment and the catering from Base Camp. Working with me on the mountains were two Mongolian mountaineers. Usukhuu, my friend of many years and previous trips, who has two ascents of Everest and one ascent of Denali to his credit. Lastly, Senguu who had lived in the UK for several years. Despite limited shared language, Usukhuu and I always get on well, especially with banter around the fact that he more or less eats only horse meat, and I’m vegetarian. The mountains are reached by a four hour flight from Ulaan Bataar to Bayan Olgii. Then a 6-9 hour drive off road (there are no hard topped roads) in Russian jeeps to a point described without irony as the Road Head, marked by two Gers (known elsewhere as yurts) and a scattering of nomad encampments. Here the landscape is a bit like the Cairngorms in drought, but on a grander scale. A few summers ago a nomad camped near us at the Road Head found a wolf cub abandoned by the pack. He raised it tethered to a stake alongside their herd of goats until it got strong enough to be returned to the wild. In the winter they hunt with eagles. The Base Camp is usually reached with a one day trek using two humped Bactrian camels to carry the gear. They are gentle and friendly, unlike their grumpy Arabian cousins, the Dromedary. Base Camp is a couple of Gers set in a beautiful green ablation valley alongside the enormous Potanina Glacier. The area is becoming more popular but it is still rare to find more than one other group in the Base Camp. This year we could only use camels for our return journey as they were occupied elsewhere gathering winter fodder, so the jeeps went to Base Camp. The highest peak is Mount Khuiten, sometimes written in translation as Huiten (4374m).It was first climbed by a Russian and 12 Mongolian climbers in 1956. All the peaks in the area have been climbed but the potential for new routes up the many dramatic faces and ridges is vast. The alpine character of these peaks and their remote location makes a rescue nigh on impossible. If you go there, it is a proper mountaineering adventure. However, unlike on an expedition to the Himalaya or even the Andes you can get there, climb several superb routes and be back at work in the UK in about two weeks. However, both your head and your heart, like mine will still be in the mountains of this part of Mongolia for many years. From our Base Camp we made an ascent of Malchin (4037m) as a warm up peak. 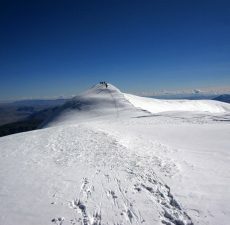 It gives some steep and dramatic scrambling and a narrow snowy summit. It also gives a breath taking full frontal view of Khuiten’s awesome East Face and views across into Russia and China. To reach the other mountains all the gear, food and tents need to be carried up the glacier to make a high camp from which they can be tackled. The Potanina Glacier is the biggest of many in the area and it varies in condition depending on the weather. The glacier is highly crevassed in places, but they are not always visible after snowfall, so it always is essential to be roped up. It was also helpful having the powerhouse Usukhuu breaking trail leading the front of our three roped parties. We were lucky this year as the conditions both on the way up and at the High Camp were good. We soon had our selection of tents anchored down in the lee of a large rognon. Jane, Helen and Pip, 3 to a tent is cosy! With the help of Usukhuu and Senguu I do all the catering for the team at High Camp. Again we were lucky, it can be pretty grim in a blizzard. Our system for cooking is to use petrol with either a Primus Omnifuel stove or for sheer melting power an MSR XGK with two stoves under one pot. WWe had also purchased very large aluminium pots for melting snow from Bayan Olgii. My catering is to the say the least simple. Melting snow to make enough water for drinking, cooking and filling water bottles takes hours. In the past I have arrived at High camp and been unable to pitch the tents due to high winds even when replacing tent pegs with Russian ice screws. It is a long and demoralising journey back to Base Camp to start again. After as early a start as we could manage, we set off next morning, the 30th August to climb Khuiten, the main prize, via a col and the ridge that skirts the flank of the north face. One member elected to stay at HC, exhausted by the carry the day before. We began in the three roped parties of the previous day, but as the terrain steepened, it became clear that Senguu’s English and rope management skills were both higher in confidence than reality. At the beginning of the steep slope that leads to the summit ridge, I joined our two ropes together, leaving Usukhuu and his team ahead. I did, passed over some supplies and he continued his descent all the way back past us to the col. On arrival he bent over and then squatted, emptying himself from both ends. Moments later he was again powering back up the slope towards the rest of us. On passing me he just paused and grinned. Ushukuu is a tough guy. On reaching High Camp he tucked into another batch of horse meat. Our slope steepened to the summit ridge which is at the point we reached it wide and easy angled giving fantastic views in all directions. Usukhuu’s group went to the small final summit as there was fewer of them and we paused on the summit a metre or two lower but lacking the drop down the north face. As with all summits, it is only half way to safety. We carefully descended down the steep slope below the ridge before the easier group could be reached en route back to High Camp. The afternoon and evening we spent melting snow, rehydrating, eating and eventually sleeping. For a second night we had 3 people to each of our 2 person tents. The next morning we were off again. This time with all team members to ascend the walk up peak of Narindal (4082m). 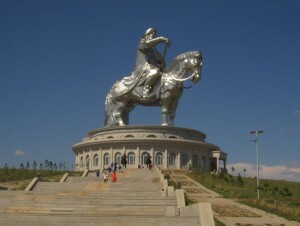 Narindal is the point at which the borders of Mongolia, China and Russia meet. From the summit we returned across the glacier via our route of ascent. There was a line of footprints from a rather large cat in the snow. No doubt a pair of eyes watched us from nearby. After refreshments and some time hacking our tents out of the ice, we packed up and descended the Potanin Glacier once more. We scrambled up the moraine at the edge of the ablation valley and trekked back to Base Camp. Sandagash, as ever came to meet us with very welcome fruit juice, followed by lunch. 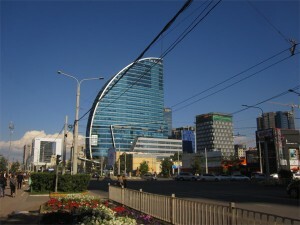 The next morning we began our 3 day journey by foot, jeep and plane back to the tower blocks. Pleased to grab a beer and pizza of Ulaan Bataar and eventually home.